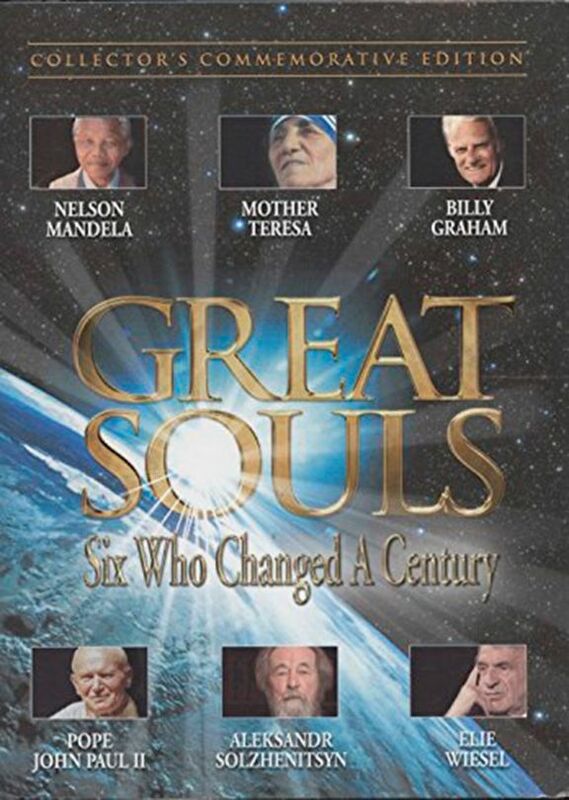 Six one-hour profiles on Nelson Mandela, Mother Teresa, Billy Graham, Pope John Paul II, Aleksandr Solzhenitsyn, and Elie Wiesel. In this landmark series of one-hour profiles, David Aikman is joined by William F. Buckley (National Review), Sir David Frost (BBC), Dan Rather (CBS), and Walter Issacson (CNN), headlining roster of leading journalists and authors to give the world an inside look at the dramatic challenges and sometimes controversial crossroads that shaped these six world-shaping lives, that made each one a hero of our time and one of the twentieth century's Great Souls. Profiled are Nelson Mandela, Mother Teresa, Billy Graham, Pope John Paul II, Aleksandr Solzhenitsyn, and Elie Wiesel.